Very large forces are generated during a collision; these forces have to be absorbed. Passengers of a vehicle which is headed for a brick wall. They are not using seat belts. 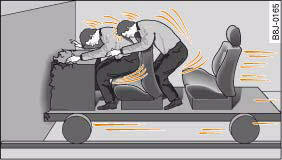 Both the moving vehicle and the passengers possess energy, which is known as “kinetic energy”, fig. 204. The amount of “kinetic energy” depends on the speed of the vehicle and the weight of the vehicle and passengers. The higher the speed and the greater the weight, the more energy there is to be absorbed in an accident. The most significant factor, however, is the speed of the vehicle. 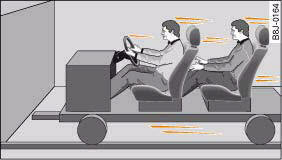 If the speed doubles from 25 km/h to 50 km/h, for example, the kinetic energy increases by a factor of four. Because these passengers are not restrained by seat belts, the entire amount of kinetic energy has to be absorbed at the point of impact ⇒ fig. 205. This would result in serious or potentially fatal injury. Even at urban speeds of 30 km/h to 50 km/h, the forces acting on the occupants in a collision can reach the equivalent of 1 ton (1000 kg) or more. At greater speed these forces are even higher. A rule of thumb: if the speed doubles, the forces increase by a factor of four. Passengers who do not wear seat belts are not “attached” to the vehicle. In a frontal collision they will continue to move forward at the speed their car was travelling just before the impact. What happens to passengers not wearing seat belts? Passengers not wearing seat belts risk fatal injuries in the event of an accident. In a frontal collision, unbelted passengers will be thrown forwards and make violent contact with the steering wheel, dashboard, windscreen, etc ⇒ fig. 206. Passengers not wearing their belts risk being thrown out of the car, resulting in potentially fatal injuries. 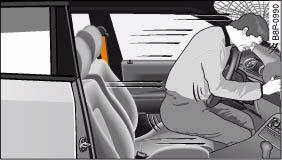 The common belief that occupants can brace their weight with their hands in a minor collision is false. Even at low speeds the forces acting on the body in a collision are so great that it is not possible to hold yourself in the seat. It is also important for the rear passengers to wear seat belts, as they could otherwise be thrown forwards violently in an accident. 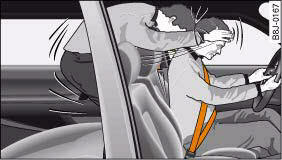 Rear passengers who do not use seat belts endanger not only themselves but also the other occupantsgggggg 196, fig. 207.